This popular breakfast cereal and snack comes in many varieties, some more healthy than others. This is a healthier version that will make your kitchen smell wonderful when it is baking. It's a great choice for breakfast with milk or yogurt or as as a snack, just as it is. You can also personalize this recipe by changing the type of nuts and seeds that you include, based on what you have available and your personal preference. While this recipe is chock full of vitamins, minerals, healthy proteins, carbs and fats, it is important to note that it is also calorie dense. This means that you need to eat it in moderation. It also means that it is a great take-along snack for high energy activities like hiking. It is easy to carry and will give you the energy boost you need. You can interchange the nuts that you use, based on what you like and what you have on hand. For instance you can use peanuts, instead of pecans or two cups of pecans instead of cashews, etc. Almonds are an oval-shaped nut that, in their sweet form are popular as a snack, as a flavoring, as part of cereals and as an ingredient in recipes, especially desserts and garnishes. They are readily available in more forms (in-the-shell, shelled whole, sliced, slivered, blanched and paste) than any other nut. Almonds are high in protein, fiber and minerals, particularly calcium, and a good source of B vitamins. Brazil nuts are large, high-fat nuts, native to the Amazon region, that grow in clusters and have a hard brown shell. They are rich in minerals such as selenium. Cashews are a tan-colored, half-moon shaped nut, native to South America, not sold in the shell due to a toxic irritant in the oil of the shells. They are eaten roasted rather than raw and are higher in carbohydrate and lower in fat than other nuts. They are also rich in protein, minerals, B vitamins and fiber. Coconut is the fruit of the tropical coconut palm tree. The “meat” and “milk” are used for food and the oil is used both in edible products such as baked goods, and inedible products such as soap. Coconut is a good source of vitamins and minerals and is considered a “super food” by some alternative health practitioners. The oil from the coconut is one of the few plant oils that is saturated. Pecans are a native North American nut with a thin, smooth brown shell and lobed “meat” related to walnuts and hickory nuts, but with a richer flavor. Pecans are a good source of Vitamin E, potassium and protein and may have cholesterol-lowering properties. Sunflower seeds are small seeds that are gray when hulled. They are used for their oil and as food, and are a good source of Vitamin E, magnesium and selenium. Sunflower seeds may help lower cholesterol and high blood pressure. They come in larger, striped hull or smaller, black hull varieties. Walnuts are large, brown nuts with a rough shell and lobed “meat” loaded with heart-healthy fats. They help to lower cholesterol and are a good source of fiber, Vitamin E, protein and minerals. Walnuts are a good source of Omega-3 fats and may be found in English and Black varieties. 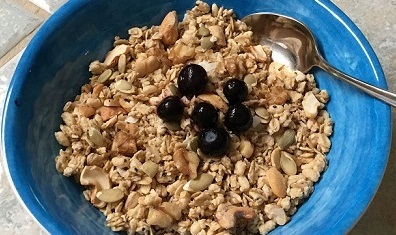 Click here to go from Recipe Granola page to Healthy Grains page.